A report on America’s rising pedestrian death toll released by the Governors Highway Safety Association [PDF] estimates that about 6,000 people were killed while walking last year — the highest number in two decades. That’s a 22 percent increase over just two years, significantly higher than the overall increase in traffic deaths. The GHSA notes that vehicle safety technology has improved quite a bit in recent decades, reducing fatalities for drivers, while pedestrians have no such advantage. There are certainly ways to protect people walking, however. Namely, streets can be designed so fewer drivers travel at lethal speeds. But these solutions don’t get much attention from agencies like the GHSA or the National Highway Traffic Safety Administration. Instead, America’s traffic safety establishment has long been focused on “behavioral” explanations for traffic deaths — things like seatbelt usage and drunk driving. And that makes sense, to a point: Government interventions to promote seatbelts and discourage driving under the influence have made driving safer. But the limitations of that approach are all too apparent as America continues to fall further behind other nations on traffic safety. Countries that have made it a priority to limit motorist speed in crowded places are faring much better than we are. Tens of thousands of lives would be saved each year if the U.S. achieved a safety record comparable to nations like the UK, Germany, or Japan. We know street design is part of this problem because there are patterns to where fatal collisions occur. Heat maps of pedestrian fatalities show that pedestrians are struck and killed by cars at the same intersections and along the same corridors over and over again. Are people using cell phones more in these locations? I doubt it. Street design plays a clear role. There are plenty of transportation engineers fighting for safer street design. Engineers Peter Furth and Ian Lockwood, for instance, cities should make pedestrian safety and convenience, not traffic movement, a higher priority. Several city DOTs are starting to prioritize walking and biking in their official practice as well. But this attitude has yet to penetrate the core institutions of the American engineering establishment. At the obscure but influential National Committee on Uniform Traffic Control Devices, which shapes the street design standards followed by engineers around the country, change comes very slowly. When Streetsblog talked to committee chair Lee Billingsley a few weeks ago, he said the group had no plans to shift course in response to rising fatalities. He insisted that rules governing pedestrian signal timing, for instance, “have stood the test of time,” even as America’s pedestrian safety record has deteriorated. How many people will die before the traffic safety establishment does some soul searching about the systems they’ve designed and starts reforming practices that have needlessly put people at risk? … and that’s just in terms of pedestrian fatalities. If you include everyone killed in collisions, its a 9/11 every month. Month after month. Imagine what could have been done if just a fraction of the misdirected trillions spent on the War on Terror in Iraq (which resulted in killing another 9/11s of USA soldiers and an obscene number of Iraqis) were instead spent to improve street safety here at home. Our actions are misplaced if we truly want to improve the safety of Americans. good point – In addition, 2,500,000 Americans are hospitalized every year by traffic violence. 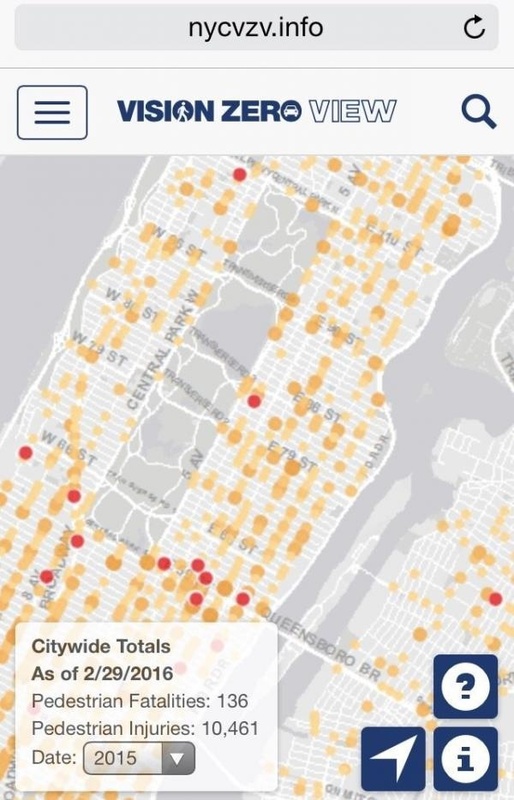 Attached is a map of 5 months of traffic violence on Upper East Side. It’s horrifying and in the ‘burbs it’s worse. “Softer bumpers and modifying the front ends of vehicles (e.g. removal of unnecessarily rigid structures) can reduce the severity of a pedestrian impact with a car. Nice hack reporting as usual Angie. Perhaps if pedestrians put their phones away they wouldn’t step out in front of speeding cars. Or if driver put their phones away they’d stop hitting people! Victim shaming is so 1975. The facts are that the vast majority of pedestrians are hit and killed when walking legally in marked crosswalks with the light. If I have the right of way, walking with a light, even if I am looking at a device while doing so, and you hit and kill me, you are a murderer. It’s really that simple. But the transportation experts would let you off with maybe just a slap on the wrist. Must be nice to be so coddled, subsidized and protected from the consequences of your actions. Once again Angie is off the mark. The NCUTCD is not promulgating street design standards. They only deal with signs, signals, and pavement markings. How those are incorporated within roadway design is up to engineers. Some do a good job, some do a bad job, but fundamentally the MUTCD is not the problem with design. Plenty of the MUTCD is bike and ped oriented, and more progress is being made. But her constant flogging of the NCUTCD is totally misinformed. Also, how do we explain the sudden spike in ped deaths? At a time when more attention is being given to bike and ped design we are seeing these increases. Without knowing all of the factors it is silly to attribute it solely to design. As for 1976boy’s comment; that is factually wrong. ped crashes and fatalities occur at intersections and non-intersection locations pretty evenly. How about making sure not to hit bicyclists and pedestrians in the first place? I’ve been hit twice on my bike and neither instance would have had a different outcome had these standards been implemented. It is a bunch of window dressing. Millions more will be killed before the traffic establishment admits that they’re killing people. The freewheeling phenomenon and the city slicker syndrome, combined with civic inattention is involved. The public is responsible for the slaughter, not the government. The fact is, that the public is ignoring traffic laws and no one cares. On Mother’s Day, watch how parents drive and jaywalk, with their children. It’s not the government, but the public. Suicidal city slickers and the freewheeling family phenomenon, combined with civic inattention, resulted in an avalanche of karma. The slaughter of pedestrians is because of lawless streets and adults. Adults are merely feeble-minded creatures that don’t get traffic laws. Their inner ear ( Vestibular Structure) betrays them, through Velocitization and the freewheeling phenomenon. Don’t step in front of a moving car. Lawless streets and adults result in crime and death. Civic inattention led to mass disobedience on our streets and highways and stopping the slaughter is easy. Introduce a conscience to American parents. If the drivers obeyed traffic laws, they would have a safe future. The current freewheeling phenomenon resulted in a bloodbath, internationally. Lawless streets are the result of lawless drivers, lawless cyclists and lawless pedestrians. The freewheeling family phenomenon, continues the lawless street problem, year after year. Introducing law-abiding streets and adults would work, by introducing a conscience. Too sensitive politically, but a great way to educate children about adult lawlessness. Civic inattention leads to an avalanche of karma. Ending lawless streets takes a robust and vigorous attitude. People don’t give a damn about safe streets. Pedestrian deaths have skyrocketed over the last five years. In 2017, nearly 6,000 people were killed while walking on American streets. They're up again in 2018, according to a new estimate, to 6,227 -- the highest since 1990. SUVs and the growth of the Sun Belt are likely explanations. This week, the Governors Highway Safety Administration issued a press release telling state DOTs that instead of telling people not to drink and drive, they should tell everyone, including pedestrians and cyclists, not to drink and go anywhere.